Between May 7 and 10, 2018, SES managed and conducted a joint federal, state and industry foot-and-mouth disease (FMD) functional exercise (FE) named ARMAR. Over the four days of play; almost 1,700 state, Federal, local and industry personnel participated in the FE; responding to a simulated disease outbreak that evolved to a Regional/National-level incident. The Federal lead agency, USDA Animal and Plant Health Inspection (APHIS) Veterinary Services (VS), was fully engaged in ARMAR, as were the primary federal support agencies for a FAD response; as well as six states (CA, CO, MN, MT, SD, WI) that were responding to the simulated outbreaks within their borders. An additional 250 personnel, from seven states (IN, KY, MI, ND, NE, OK, TX), participated in aligned one or two-day tabletop exercises (TTX), during this time frame. The ARMAR exercise was a culmination of a multi-year effort sponsored by the VS National Training and Exercise Program. SES conducted this work under a subcontract with Iowa State University’s Center for Food Security and Public Health (CFSPH). During the entire multi-year process, SES was the lead exercise design and conduct entity. 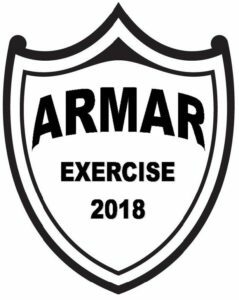 In addition, SES helped design, coordinate, and implement multiple preparation activities: webinars, trainings, and preparatory TTXs; all developed in the two-years leading up to the ARMAR exercise.